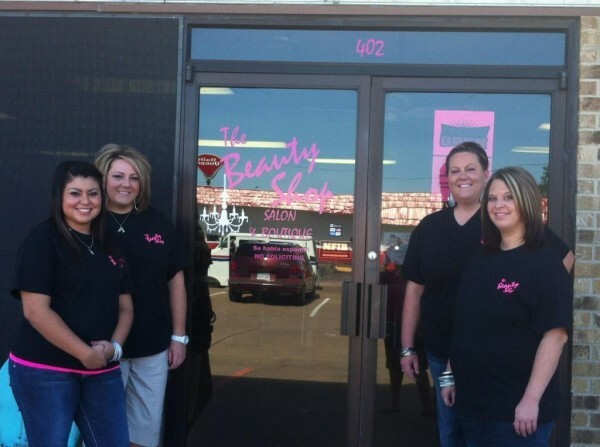 In a small town in Groesbeck, Texas, two sisters (Christen Jackson & Chrashel Howell) started a very unique Beauty Shop -Salon & Boutique and opened their doors to the public, September 10th 2012 for the first time. Before they could proudly commence business they needed a flattering store front, signs inside and out, as well as local school spirit wear to sell as they are a boutique as well as a salon. Signco/Stylecraft printed custom t-shirts for their store and for the staff as well as the spirit wear they will be selling to customers. Signco also created their large outdoor sign as well as all of the door signs on the inside such as "Spray Tan Room", "Office", "Dressing Room", and more. When creating the signs and t-shirts, The Beauty Shop wanted a Hot Pink color throughout and this was easily done because Signco has a wide assortment of ink colors as well as matching vinyl to go with it! Now the Beauty Shop is up and running and looking great no less while offering the newest techniques in hairstyles that is closer to home for the locals of Groesbeck. These girls really have a special place filled with great talent and even antiquities to buy while your treating yourself to a new do.